What happened to Ebenezer Scrooge after the night he was visited by the three spirits? At the end of A Christmas Carol, as we last left Ebenezer Scrooge he appeared to be a man transformed. But did he sincerely repent and earn admission to heaven? The Trial of Ebenezer Scrooge, written in Dickensian style and with tongue firmly lodged in cheek, follows Scrooge through the Court of Heavenly Justice, where his soul's fate is to be determined. In this courtroom drama, using frequent flashbacks, the author uncovers startling evidence, much of it directly from Dickens's classic, that reveals Scrooge to have lived a saintly life before being confronted by three Christmas ghosts. Evidence mounts that Mr. Scrooge struck a Faustian bargain with the Ghost of Christmas Yet to Come, a deal to extend his own mortality in exchange for yielding his soul as a tool for the forces of darkness to infiltrate heaven. Readers will enjoy the remaking of some of Dickens’s most well known characters. Tiny Tim emerges as a villain, while little Eppie, borrowed from George Eliot’s Silas Marner, is Scrooge's protector and source of salvation. 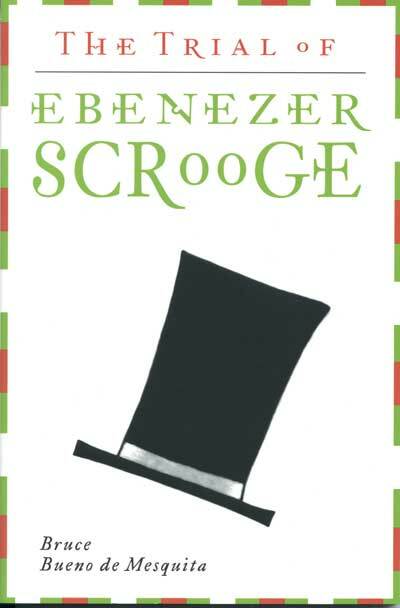 This new novel provides the much needed redemption of Ebenezer Scrooge’s reputation and offers a welcome departure from the standard saccharine fare at Christmas time. Dickens buffs will have a merry time trying to find where Dickens's voice ends and the author's begins. All readers will puzzle over how we could have so misjudged Ebenezer Scrooge, or whether we judged Scrooge aright from the start. This book is a timely holiday gift for the Dickensian in the family. Bruce Bueno de Mesquita is a Senior Fellow at the Hoover Institute at Stanford University and the author of ten books that he alleges are not fiction. He is confident that Charles Dickens never really intended to slander poor old Ebenezer Scrooge.